It is no secret, I am NOT a huge fan of BBQ sauce. I have had this discussion before and so I find it redundant to do it again. The good news is, when you make your own sauces, you can make them taste good to you! More of this, less of that, and NONE of that other stuff! I have 2, 10lb bags of chicken hindquarters, (.59 per pound), great deal or what? My husband asked for some baked chicken, so this is what he got. I threw in some potatoes, and called it dinner! Boy did I eat my words about how I didn't want BBQ!!! This would be so easy to make for a crowd. And the leftovers, I am told were twice as good the next day. Maybe you want to marinate your chicken overnight, or maybe you will just brush it on like I did. 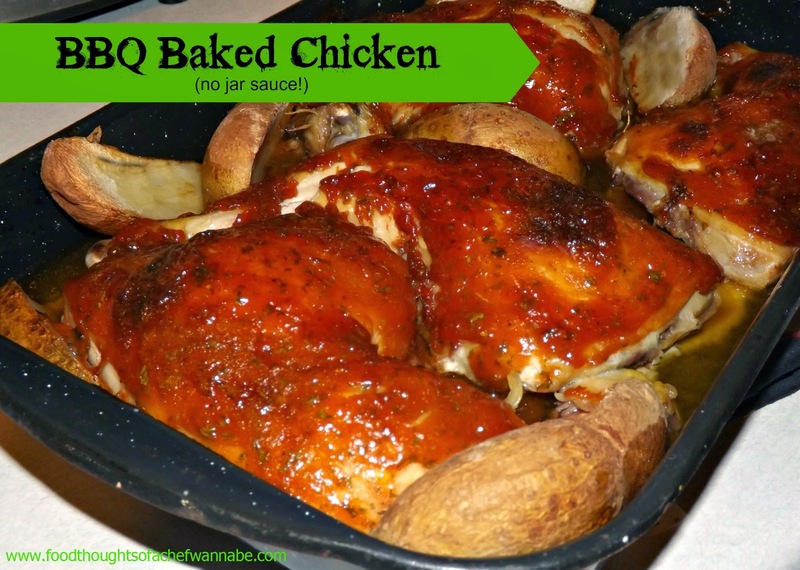 Either way, this is sure to be a hit for chicken and BBQ lovers alike! The recipe is easy and great for anyone, especially beginners. Feel free to use any bone IN chicken you want! Preheat your oven to 375 degrees F. In a 9x13 pan, arrange your chicken. I added a few cut up potatoes as well. In a small bowl combine all remaining ingredients Brush or pour over the chicken liberally. Bake Uncovered for 45-55 minutes. The internal temperature should read 180 degrees when done.